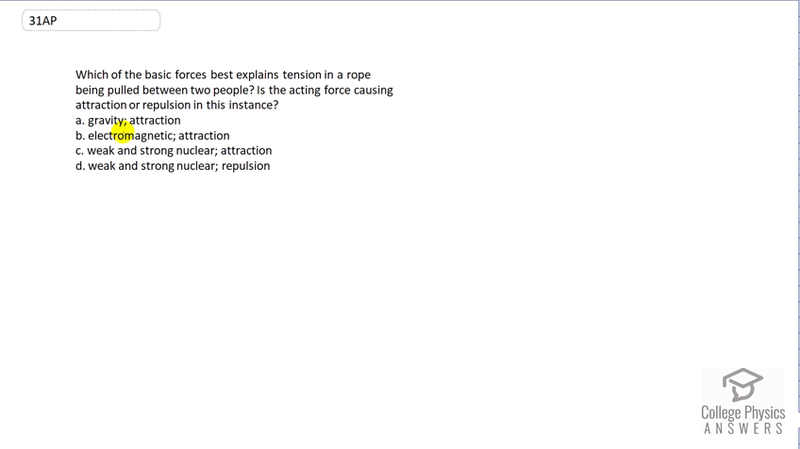 Which of the basic forces best explains tension in a rope being pulled between two people? Is the acting force causing attraction or repulsion in this instance? This is College Physics Answers with Shaun Dychko. The force that is keeping all of the atoms and molecules within the rope bonded together is the electromagnetic force. Gravity is not keeping the particles of the rope together and nor are the weak and strong nuclear forces because these forces affect only inside the atom. But it's the electromagnetic force that has an effect between molecules and between atoms and this is what keeps any material bonded together.